I'm pretty new to Vermont, so, though I've reported on the Green Mountain Film Festival in print and on television now, I hadn't actually attended it until yesterday, when I drove down to Montpelier to catch a screening of A Field in England. The film, which screened in the cozy basement of the Savoy Theater, was on my short list of titles to see in this year's fest, so I'm glad I was able to catch it. The film's director, Ben Wheatley, had a film in last year's fest, too: the dark comedy Sightseers, which apparently has the ability to divide audiences pretty sharply. So, I would imagine, does A Field in England, which is a very odd movie, indeed. Check out the trailer below. Set in 17th-century England, the film has an admirably simple premise: Four characters wander through the titular field in an attempt to escape a raging battle; when they meet a fifth, their fortunes change, as this man takes charge and puts the other four to work for him searching for buried treasure. Oh, and, along the way, the main character, Whitehead, eats a ton of psychedelic mushrooms and starts hallucinating the emergence of swirling black planets. That admirable simplicity quickly spins out of control, as even the most mindless tasks (digging a hole, walking in a straight line, even defecating) become more and more difficult as the characters very likely go insane. It's difficult to tell what actually happens in this film, because so much of it appears to be presented in the form of dreams, memories, visions or hallucinations. I was happy to be confused by it, though, mostly because the cinematography was so bloody lovely. Shot in black and white and filled with astonishingly vivid close-ups of insects and droplets of blood, this film is really beautiful; terrific compositions, too, as evidenced below. About eight years ago, Steven Soderbergh's oddball film Bubble made news for being released in theaters and via on-demand services on the same day; the home video release followed a few days later. In that time, relatively few films have opted for this multi-platform release strategy, though now A Field in England must be added to that list: It came out in theaters, home video, on-demand services and "regular" television at the same moment. According to this BBC article, this distribution experiment was a success; it will be interesting to see if other films follow in its footsteps. I was keen to see A Field in England since, even though I hadn't seen any of Wheatley's other features, I was familiar with the short videos that he'd made for online release. For at least five years or so, I've been aware of his very clever short-form work, like the laugh-out-loud video below. So I wanted to see what he could do with a longer narrative. Turns out Wheatley has some pretty experimental leanings. 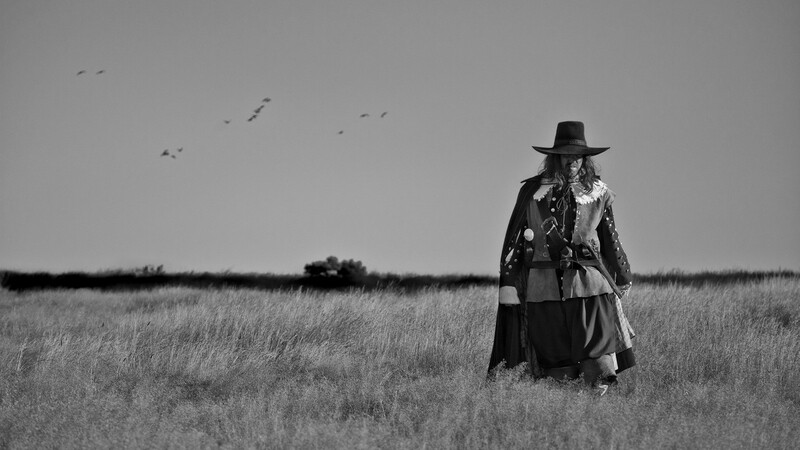 A Field in England is really quite challenging at the level of narrative, and it uses editing and cinematography in some unconventional ways. I'm curious to see his other features, and will be looking forward to more of his work. I enjoyed the laid-back vibe, both at the ticket office and at the Savoy, where patrons and volunteers alike were friendly and film-focused. It looked like a few technical glitches still needed to be worked out in the ticketing system, but nothing beyond the grasp of the dedicated staff. The projection of the film was flawless. And I really enjoyed the cavelike atmosphere of the Savoy's basement theater, which I'd never visited before. I loved having my own armchair, but it seems that a years-long parade of butts has pancaked the cushions. Time to restuff!